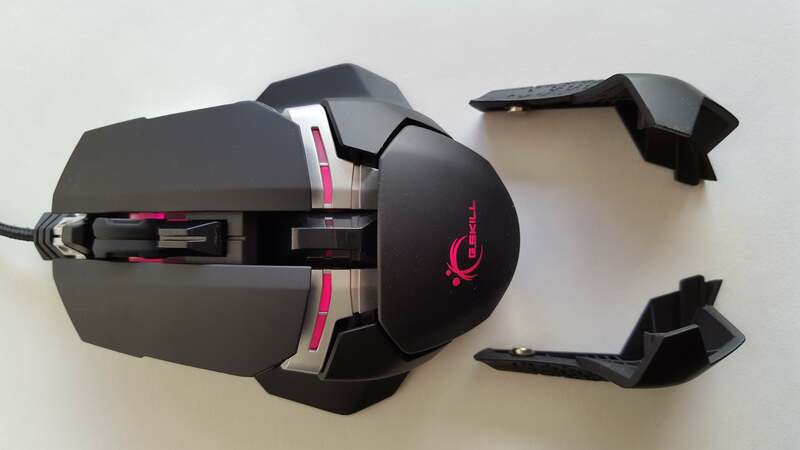 If I learned anything from Logitech’s G502, it’s “Don’t judge a book by its cover.” Or, in this case, “Don’t judge a mouse by how damn weird it looks.” Oh, hey there, G.Skill. 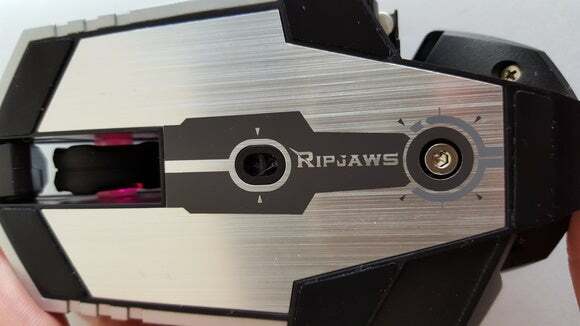 G.Skill just released its debut mouse a few months ago, the Ripjaws MX780. And if you can get past the oh-so-edgy name and design, there’s quite a bit to appreciate here. This review is part of our roundup of best gaming mice. Go there for details on competing products and how we tested them. Let’s get the basics out of the way. The MX780 is an eight-button ambidextrous mouse: The standard Left, Middle, and Right Click, a DPI switch behind the scroll wheel, two thumb buttons on the left and two thumb buttons on the right. We can run down the standard checklist here: 1,000 Hz polling rate, braided fabric cable sheathe, 512 KB onboard memory for profile storage, and an 8,200 DPI sensor. Topping out at 8,200 DPI, the MX780 doesn’t quite match the lofty (ridiculous) numbers being thrown around by some of its competitors, but for most people it’ll be plenty. The build quality also deserves a call-out—much of the MX780 is built from aluminum, and it’s both durable and gorgeous to look at. Given that most of the mice I use are entirely shrouded in plastic and rubber, the MX780 feels like a huge step up in terms of quality. It screams “Premium Mouse” even though it’s not more expensive than the competition. And the four-zone RGB lighting is as well-implemented as anything by Razer or Logitech. Just make sure you download G.Skill’s software and change the color, because the default is a ghastly salmon color. 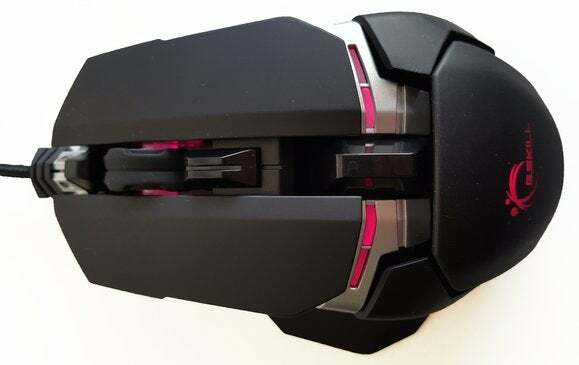 Let’s get into the cool stuff, though—namely, the fact the MX780 is pretty much “G.Skill’s less black-and-green version of the Razer Ouroboros.” Or, if you prefer, it’s an ambidextrous version of Logitech’s G502 Proteus Core. Which is about the highest compliment I could give. Listen, I love customization. I don’t think it’s essential every mouse manufacturer start enabling all sorts of tweaking and tinkering, but I appreciate it when they do. Why? Because it’s unlikely you’ll ever find a mouse you think is perfect straight out of the box. The more options you give me, the more likely it is I can make your mouse work. The MX780 gives you quite a few options. As I mentioned, this is an ambidextrous mouse, so there are thumb channels along both sides. These channels are held on with magnets, and can be swapped out for more/less textured versions with wider/narrower footprints. 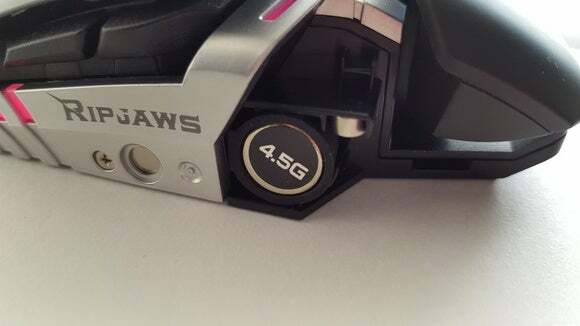 Remove the trays and you can also slot 4.5 gram weights into each side—a nice touch, though it tends to make the mouse a bit heavy in the back (or to one side) instead of the G502’s more equal distribution of weight. And even with both weights inserted, the mouse wasn’t as heavy as I’d like. Flip the mouse over and you’ll find a hex key you can turn to adjust the height of the palm rest. Used to palm-gripping? You’ll probably want to push it a bit higher. Claw gripper? Keep it low so you don’t have to bend your fingers quite as much. The MX780 doesn’t quite match the versatility or comfort of the G502, but it’s damned close—especially for an ambidextrous mouse. And I think I like the feel of it just a bit more than the Ouroboros. It’s not perfect, though. I’ve got a few significant complaints with the MX780 that I hope are rectified in G.Skill’s next outing. 1) The buttons are loud. The Left and Right buttons are fine, and have a satisfying springiness to them. But the thumb buttons are obnoxious, with an atypically noisy click that still annoys me even after hours of use. 2) The thumb buttons are also flimsy-feeling. Considering I talked up the superior build quality of the MX780, with its machined aluminum, it seems strange that the four thumb switches are so fragile. But they are, with a worrying amount of wiggle and an unpleasant sponginess. 3) And, just to continue on the theme, the “thumb” buttons are poorly placed—meaning whichever pair is not actually under your thumb. They sit too far back for my ring finger but too far forward for my pinky, meaning the second pair is borderline useless. I find myself triggering them accidentally far more often than on purpose. 4) G.Skill’s software is bunk. I’m not too surprised, given they’re pretty new when it comes to peripherals. Most other companies have had a few years to get their software in order, while G.Skill is starting from scratch. But the fact remains that it’s overly cumbersome to customize the mouse and the lighting isn’t especially accurate—a common issue with RGB products, but it’s especially noticeable here. I like the MX780, though. It’s not quite as comfortable nor as customizable as the G502, but it arises from a similar design philosophy—one I’m highly supportive of, which lets people tweak a mouse until it’s perfect for them. If you’ve got the patience to sit and tune the MX780, then there’s a great mouse waiting here—especially for lefties disappointed that they’re locked out of the G502. Those poor bastards. For an ambidextrous mouse, the MX780 is probably one of the best price/performance bargains.